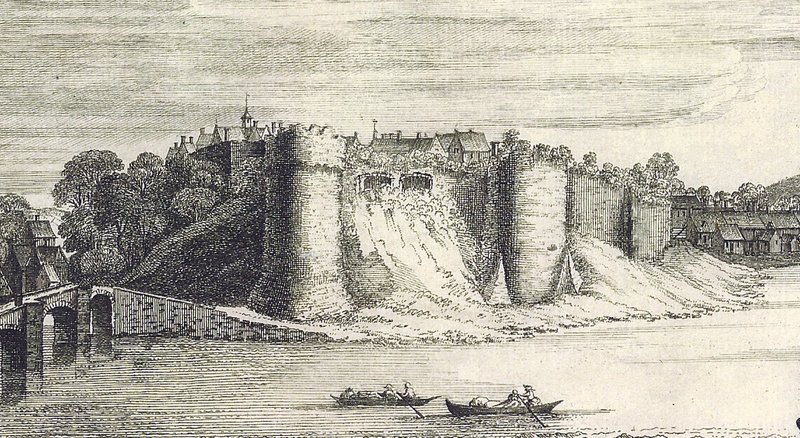 A 18th century lithograph of Cardigan castle made by Samuel and Nathaniel Buck. 1110/1136 The first castle was built at Cardigan by a Norman invader called Gilbert de Clare, replacing the earthwork built in 1093 a mile downstream. It was successfully defended by Robert fitz Martin against an attack by Owain Gwynedd which saw the town destroyed. 1166 The castle was captured by Rhys ap Gruffydd of Dehuebarth, 'the Lord Rhys'. 1171 Rebuilt in stone by the Lord Rhys. A relatively narrow wall was built along the top of cliffs and rock-cut ditch that separated it from the rest of a low ridge on which it was built. 1176 The first national Eisteddfod was held at Cardigan castle. 1197 After the death of the Lord Rhys, the castle was sold by his son Maelgwn to King John. 1215 Captured by Llewelyn The Great, prince of Gwynedd. 1216 Granted to the sons of Gruffydd ap Rhys of Deheubarth by Llewelyn during the Welsh Parliament in Aberdyfi. 1223 Captured by William Marshall, Earl of Pembroke. 1231 Recaptured for Llewelyn The Great by Rhys Grug. 1240 Regained by the Normans after the death of Llewelyn. c1244-54 Rebuilt under Earl Gilbert of Pembroke. 1248 A new keep (the Great Tower) and town walls were built. 1299 Repairs to buildings, a new bridge and a fireplace cost 104 shillings and 7 ½ pence. 1320 Edward II ordered the completion of a turret "recently begun in the angle of the wall" and also "a small wooden door in the same wall". 1341 A survey noted that the gatehouse possesed a turning bridge, a double gate and a collapsed tower while its other tower was in good condition. Recommendations included replacing the prison doors and the chamber's fireplace, re-roofing the hall, renewing whitewash and repairing a covered walkway in the curtain wall. 1343 A survey listed a bakery, kitchen, larder, two rooms on either side of the main gatehouse, hall, garderobe, pantry, food store, stable, the attic room of the Great Tower, prison tower, the gatehouse bridge, a Chapel and several other rooms. The castle was in a poor state of repair and needed repairs at an estimated cost of £814. 1378 The new roof was reported as being in danger of collapse. 1428-9. Extensive repairs were carried out. Mentioned were the stables, exchequer, kitchen, hall, Justiciars room, larder, Chamberlains apartment over the gatehouse and two rooms for the constable. There were apparently two separate wards within the castle: the exchequer ward and the constable's yard containing the Great Tower. 1429 Oaks were transported from Cilgerran for use in a palisade to replace a collapsed wall at the gate. 1644 The castle was refortified during the civil war using cannons from a wrecked warship. 1645 The castle was captured by the Royalists and then recaptured by the Paliamentarians who then slighted it to prevent its further use. 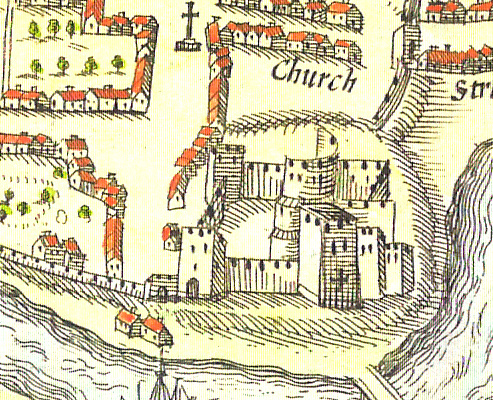 1666 Houses encircled the castle towards the river. 1713 Cardigan Borough Council levelled rubble and landscaped the castle grounds with top soil to provide a bowling green. 1808 Castle Green House was built, which incorporated the remains of the great tower. 1827 The front range of buildings was added to the house of 1808, straddling the former protective ditch. The remaining parts of the castle were said to be a section of wall and two towers, with the wall between the two towers being lowered to form a slope towards the river on which a hanging garden was installed. 1940 Purchased by Barabara Wood, daughter of a shipping tycoon, who lived in Castle Green House for 60 years. 1984 The castle had become derelict and Castle Green House was declared unfit for human habitation with Barbara Woods still in residence. 2001 Put up for sale by Barbara Woods who had moved into a nursing home. 2003 Purchased by Ceredigion County Council with a view to renovation. 2015 Opened to the public complete with holiday accommodation, a heritage centre, education facilities, a restaurant and a concert area. Continue with a tour of the norman town walls. Back to the main Cardigan page. Follow this link to read about the first stone castle at Cardigan. Follow this link for a tour of the second stone castle at Cardigan. Rare pre-restoration photographs taken in 1991 within the castle!